We have recently received some negative feedbacks regarding the HD Component RGB Cable for Sony PlayStation PS2 and PS3 which were very odd since we inspected every single returned cable and they all seemed to work perfectly! BTW I noticed there were negative feedbacks ( said it did not work and faulty etc ) left for you with regards of this cable. I think those customers did not know how to connect the RGB ( RED GREEN BLUE ) High Definition cables and those RWY ( RED WHITE YELLOW ) audio/Video composite cables. 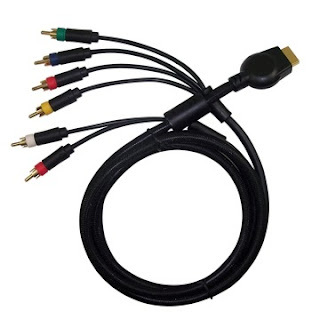 If they connect to a standard TV ( which is not a HD ready or have no Digital Input RGB socket ) then they must only connect the RWY composite cables to their TV ( which the Red and White are for Audio output and the Yellow for the Video Output ). If their TV are HD ready and also have the RGB socket. Then they should connect the High Definition RGB Video cables to the RGB socket ( and then the Red and White composite Audio cables from the RWY cables to the audio connection corresponds to the RGB socket and LEAVE and DO NOT connect the Yellow composite Video cable ) !!! Hope this helps ?! Any comments, welcome. HD Component RGB Cable for Sony PlayStation PS2 & PS3 cable available from HitariTrade for only £1.99!